Not a member yet? Read this page to find out about membership. Existing members can login below. If you are not sure of your password, or it does not work please reset it by clicking “Lost your password” below. This will send you an email to reset your password so if you do not receive it, please check your spam folder. 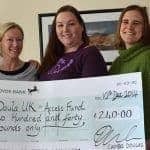 After that, if you are still having problems logging in please contact website@doula.org.uk.